Thank you for making this course available – I’m glad that we found you!. We really enjoyed doing the love language profile. Thanks for making this process so easy and fun. The Osceola courthouse recommended your program. Thanks for being so fast in giving us the certificate of completion. I really appreciated watching the videos – we both learned a lot. Thanks for offering the course – I thought it was great the way it is. Thanks for helping us skip the 3 day waiting period. I’m so glad we found this marriage preparation course. It was a lot more fun and interesting than I thought it would be. We plan on keeping it for future reference. The course was easy and I think it was great! This course was amazing and I think all couples whether or not they are getting married should do these exercises with in 3 months of their relationship. We take for granted so many things and forget about the basics. This helped us a lot -We now feel like there is nothing stopping us from just being open about everything. Our biggest achievement during this course was learning that no matter what comes our way, we would be prepared and really know how to handle those tough situations that may occur! We also now know what the other person expects and what makes the other know they are loved! This course definitely helped us, especially Nathan, with our communication skills. We actually had fun taking this course this weekend! We especially enjoyed section one! So, Glad we found this course! We learned that ut is our love that matters. Not what others think, say or feel. We put each other first. We have walked away from the negative people in our lives. We are able to work though our problems easier then before, now that we have a better understanding. Thanks for making this so easy! I learned that as a team we can execute things faster and better as far as decision making and planning things. Working together definitely gives our relationship a huge advantage! It gave us a new way to approach our disagreements. It allowed us to talk about uncomfortable topics such as money and our expectations we each have about our marriage. It made us realize that we need to work on expressing ourselves and also the need to keep open lines of communication. This course helped us connect ..like truly connect from the core of our hearts. We’ve learned many different techniques we can use for challenging situations. The games and questions have been SO helpful we can’t even fathom this program being improved. It’s perfect already! This course opened our eyes to all the hardships relationships will endure. We really enjoyed all of the exercises. Haven't done them all, but will work on them. It's great the way it is. Easy and concise, not overwhelming with detail. This gave us another amazing experience to add to our memories to cherish for the rest of our lives. This course has helped us open up to each other and communicate better. ​To waive the 3-day waiting period and receive your $25.00 marriage license discount it is necessary that you take your premarital counseling from a registered premarital provider. Not all premarital course providers are accepted in every county but don’t worry we are approved within every county. 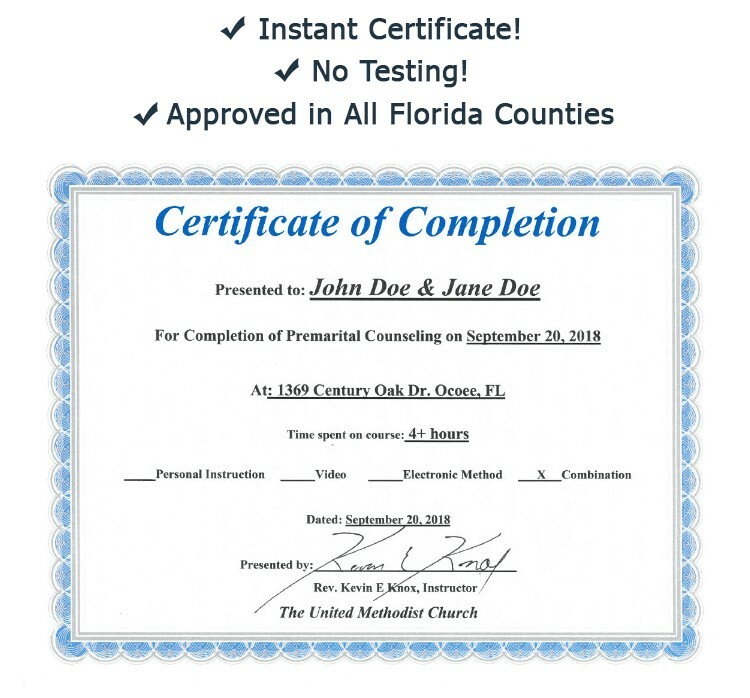 ​How long will it take for me to get my Certificate of Completion? 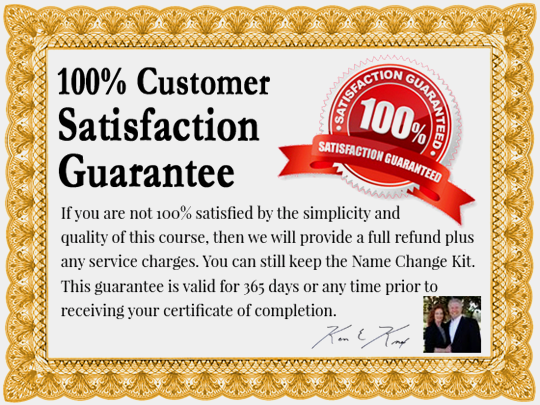 ​You will receive your Certificate of Completion instantly after submitting your verification form. No need to wait – 24 hours a day delivery. Print out the certificate and then take it with you to the courthouse to waive the 3-day waiting period. ​How long does the Florida premarital course take? ​Do we both have to pay for the premarital preparation course? ​No, the payment covers the both of you. Also, if you are Florida residents you will receive a $25.00 discount off the cost of the marriage license. ​How long will the Certificate of Completion be valid? ​It is good for one year from the date it is issued. ​Is your online premarital course accepted in Florida? 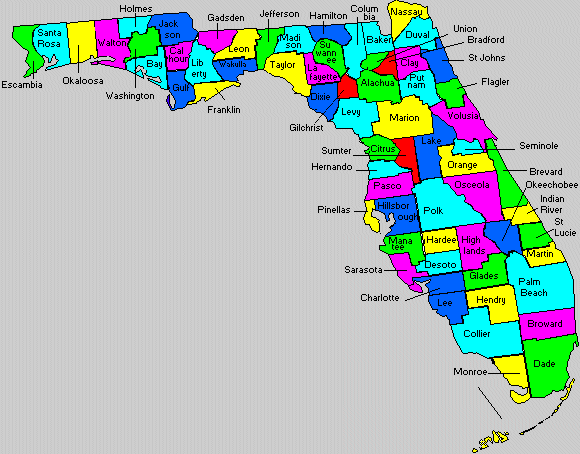 ​Yes, we are recognized as registered premarital course providers in all 67 counties in the state of Florida. On this same web page, you can check the PDF copies of our “course provider” forms to verify that we are registered with your county. ​How do we pay for the online premarital course? ​We presently use PayPal to process all payments. PayPal also accepts credit cards so it is not necessary for you to have a PayPal account to use the system. ​Can I take the pre-marital course over a time span of days, weeks or months? ​Yes, once you receive the marriage preparation course you should save it to your computer. This way, you can refer to it repeatedly as your time schedule allows. ​How does my partner and I take the premarital preparation course if we are in a long-distance relationship? ​After making payment for the pre-marital course you should save it to computer. Then, you can send it to your partner. Any discussion that’s required for the marriage preparation course can be done via Skype or phone.